Deerfield Beach, Florida – 20 March 2019 – Divers from across the United States and around the world are coming together in an attempt to break the world record for the largest underwater cleanup. 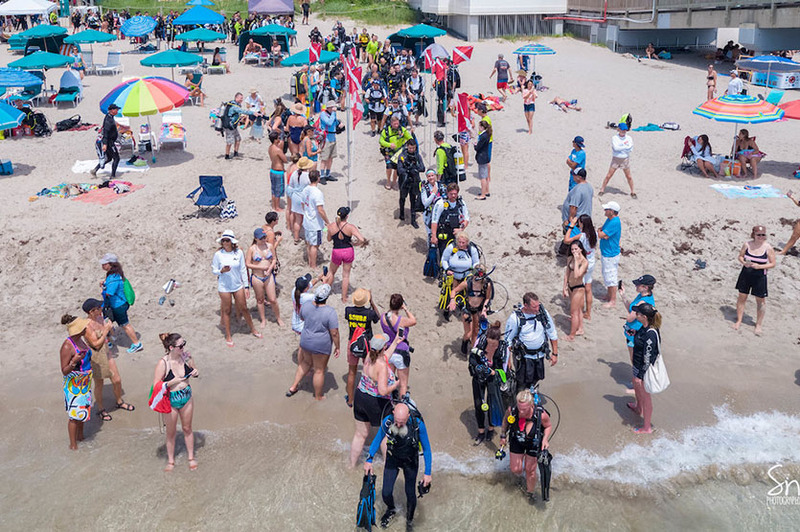 More than 700 divers are expected to take part in the record attempt in Deerfield Beach, Florida, USA, on 15 June 2019. PADI® (Professional Association of Diving Instructors®) is the world’s largest recreational diver training organization with more than 6,600 dive centers and resorts and 137,000 professional members worldwide. Celebrating industry leadership for over 50 years, PADI has remained dedicated to introducing new divers to the thrill of scuba diving and enhancing the skills of experienced divers. Issuing 1 million certifications each year, PADI makes underwater exploration, travel and adventure accessible to people around the world while maintaining the highest industry standards for dive training, safety and customer service. All PADI programs, from entry-level through professional-level training, fall under strict educational standards monitored for worldwide consistency and quality. Throughout its deep history, PADI has displayed a longstanding commitment to environmental conservation through its course offerings and alignment with organizations, such as the Project AWARE® Foundation. PADI is committed to supporting social and environmental efforts through its Pillars of ChangeSM, empowering divers with information to get involved with causes they care about in a tangible way. For more information, visit www.padi.com. Sponsored by local dive centers, PADI® and Project AWARE®, the event brings together the local and international dive communities with dozens of teams including dive centers, clubs, university groups and members of the dive industry participating. Marine debris removed during the event will be recorded via Project AWARE’s Dive Against Debris®, an underwater debris data-collection program that improves the health of ocean ecosystems through localized citizen-science efforts and provides valuable information to help inform policy change. A judge will be present to make the record for Most participants in an underwater cleanup in 24 hours (single venue) official during the event. The title is currently held by Ahmed Gabr, who organized 614 scuba divers for a cleanup in Egypt on 5 June 2015. In 2018, 386 scuba divers in Deerfield Beach were awarded with the GUINNESS WORLD RECORDSä title of Longest human chain underwater. At the record-breaking event, participants rallied to clean up the Deerfield Beach International Fishing Pier, which supports an abundance of marine life but is normally closed to divers because of fishing. More than 300 volunteers collected one-half ton of lead weights, 52 pounds of wood, 161 pounds of fishing line, 104 pounds of metal, and 102 pounds of miscellaneous debris, which were removed from Deerfield Beach shores. Additionally, 219 miles of fishing line were removed from the pier’s pilings. With hundreds of additional divers participating, this year’s event is expected to generate an even greater impact. All certified divers, whether new to diving or highly experienced, are invited to register to be part of the record attempt. Non-divers are encouraged to get involved as volunteers or to take the PADI Open Water Diver course prior to the event to join in the underwater cleanup. Participating divers are encouraged to take the PADI Dive Against Debris Specialty course with their local PADI Dive Center or Resort in advance of the cleanup to learn about marine debris and how to establish a Dive Against Debris survey. The event is free to the public; however, a $30 administration fee is charged to be part of the record attempt to help pay for the official judging and other expenses of an undertaking of this magnitude. Advance registration to be a diver or volunteer (free) is required. Those who choose to participate in the attempt will receive a long-sleeve wicking shirt, a small gift bag and will be eligible to apply for an official certificate of world record attempt participation. Volunteers who are not in the attempt will receive a free event t-shirt and goodie bag. Leaders in the dive industry are encouraged to rally their divers to participate in the world’s largest underwater cleanup as a team. Visit https://www.racersignup.com/world-record-attempt-largest-clean-up-underw... for additional event details and to register as an individual participant, team or volunteer.